Last week was Swarthmore Women’s Week, a collaboration between the Dean’s Office and twelve Swarthmore student groups including the Women’s Resource Center (WRC) that focused attention on women’s issues from a broad range of perspectives. By pulling together a variety of student groups that don’t all necessarily center on women’s issues, the week generated an impressive list of events across and even off campus. The week’s events included multiple spoken word workshops with women brought to campus by OASIS, an i20 professor-led panel discussion about transnational women in media, and a movie screening and conversation about the movie Real Women Have Curves organized by ENLACE. Other events included a women’s luncheon at the WRC, a thank-you card-making party for female alumnae, and a workshop on alternatives to sanitary pads and tampons. The WRC, with the help of Assistant Dean and Gender Education Advisor Karen Henry, spearheaded the Week’s planning and served as the umbrella under which the events were organized. “Our purpose was starting really comprehensive dialogue and bringing lots of groups together on an issue that’s really important,” Sparks said. Singh, Sparks, and Durning all expressed their optimism about holding another Swarthmore Women’s Week in the future. 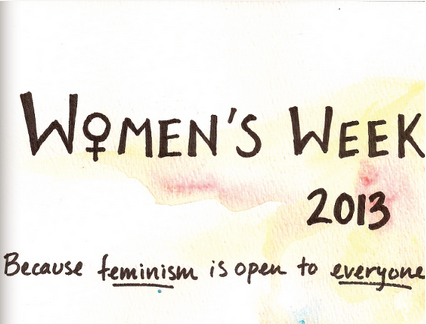 Sparks called Women’s Week a successful “pilot program” in collaboration between multiple student groups. She also expressed her hope that other groups would pursue organizing similar events in the model of the Swarthmore Women’s Week. “There are so many different awesome groups at Swarthmore. If we collaborate together, the potential is just huge,” Sparks said. Featured image courtesy of Iris Fang ’15.